Tritone Type D Rental Apartment is located on the 1st floor of an ancient palace (1400) that has endured several renovations throughout the centuries, up to the most recent one concluded in May 2005. The position is right in the historical centre, in the prestigious Via Del Tritone. The area where the apartment is located, is one of the most prestigious and aimed of the city: equidistant from the Trevi Fountain and the Spanish Steps, and just few steps away from the famous Via Veneto and Piazza Barberini. This area is one of the most favorite by those who love a “cultural walk” or simply enjoy shopping. The famous Italian and international "griffe", together with many famous restaurants and canteens can be found in this area. The underground station (Linea A, Barberini Stop) is very close, the nearest taxi station is in Piazza Barberini and the several buses will help our guests to reach any place across the city. 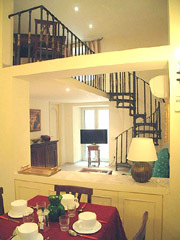 The rental apartment of about 65 sm can accommodate up to four people. There is a day-area with a kitchen corner, a table and sofa-bed that can be turned into a French-size bed, a bathroom with a shower. Then there is a raised balcony area where a bedroom and a second bathroom are located. The entrance of the apartment gets into an area where on the right you can find a fully equipped kitchen corner, with a table and - on the left - a couch and a side board. There is also a bathroom with a shower. An elegant spiral staircase lets into a bedroom with a double bed, a desk and a closet. On the higher level there is also a bathroom with bathtub. The walls and the wardrobe have a cream pastel tone. The floor is very elegant, in typical Italian “cotto” tiles. All the wall hangings are made in fabric, matching to make the apartment cosy and relaxing. All the windows of the apartment overlook a cloister, ensuring absolute tranquillity. The rental apartment has an independent heating system, an air conditioning system, washing machine, dishwasher, flat-screen TV with satellite channels, and a safe: all these comforts will make for an unforgettable vacation.